Stoner Periodontic and Dental Implant Specialists has served Columbus, the surrounding area, and patients from 41 other states for 15 years. We possesses the expertise you seek to get the best in implant dentistry. Many people place dental implants, and some patients even serve as “guinea pigs” for those practitioners that dabble in implant surgical treatment. While some practitioners take weekend courses to place dental implants in models, you can find comfort in the fact that Columbus’ Stoner Periodontists has the implant experience, training and know how to give you implants that can last the rest of your life. To make it easiest for you, we have 4 greater Columbus locations conveniently located in Dublin, New Albany, Springfield, and Chillicothe. If you are one of the 70 million people in the United States missing some or all of your teeth, it’s important to know you are not alone. Millions of people with missing or extracted teeth struggle with confidence and overall functionality. If you’ve done your research in the industry of cosmetic and implant dentistry, you would have found that many procedures can help replace a missing teeth. If you’re looking to upgrade not only the aesthetics of your smile but also the strength and functionality of your bite, then perhaps dental implants may be your solution. 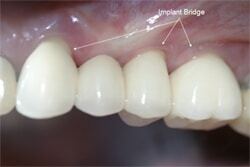 Implants are regarded as the best option for replacing missing or diseased teeth. Trust the Experts at Stoner Perio Specialists. Dental implants offer the support and stability of a natural, healthy tooth as it mimics a root. A small, artificial root is used to create the strength to withstand a healthy bite. A dental crown is the replacement in the form of a restoration that attaches to the dental implant. This procedure is the closest treatment option to a natural tooth. They are a permanent way to replace missing teeth and implants offer strength that is stronger providing the same form of function and aesthetics as a natural one as well. 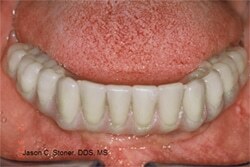 Consider Stoner Periodontics for your dental implants solution in Columbus, OH today. There are many reasons to choose dental implants procedure over the other replacement options; however, this is the only treatment option that is a permanent replacement for your missing teeth. It is also the only option on the market that can last a patient for more than 20 years! There are many reasons as to why this procedure offers far more quality than many other options. Some of the benefits listed above could be reasons alone as to why this treatment option is better than the rest. 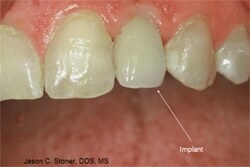 Another advantage of dental implants is that they preserve the integrity and strength of the bone. When a patient chews, the bite pressure should be spread out evenly among all teeth in the mouth. If the patient is missing a tooth, the bone strength below the gum line will slowly begin to deteriorate as the pressure is not able to be exercised-much like a muscle where if you don’t use it then it shrinks. It is incredibly vital to replace the missing tooth as it could cause bone issues in the future- which may call for a bone graft treatment years down the line! Another benefit of is not only do they rejuvenate the smile by bringing it back to life, but they can also affect the overall face. When there is missing teeth, the outer skin that covers that space will start to sag prematurely, which can make a patient look older than they are! Replacing the missing tooth can allow the patient to avoid this issue altogether! We are your solution in the Greater Columbus, OH Metro. Dental Implants are strong and attractive replacement option for the patients who are looking for a permanent solution. 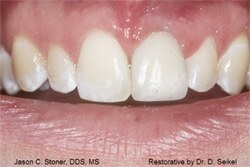 This treatment is made up of three parts that come together to form the restoration. A titanium root acts as the foundation of the restoration. It acts and mimics the function of a root. Titanium is the only material used for this treatment as it has been proven that titanium is the only material that can actually fuse together with a human bone to create the necessary strength to withstand bite forces– this process is called osseointegration. This is the same biologically-compatible material that is used to create artificial knees, hips, or other prosthetic appliances. It is the perfect material to allow strength and functionality to be added to your smile. After placement, a few months of time is allotted to allow the bone and post to fuse together to create the foundation needed to hold the restoration (typically 2 months). When the post has fused, an abutment is added to the post to act as the foundation. The dental crown is then added to the abutment. This is the only portion of the restoration that anyone can see, every other piece is below the gum line; however, the titanium post will mimic the strength and functionality of a natural root-so much so that most patients forget it’s a replacement after a few short uses! The dental abutment and crown are made custom for each patient by your dentist to ensure the shape, color, and size matches the rest of the your oral cavity. Porcelain is a popular material used to create a dental crown as it mimics the look, feel, and strength of a natural tooth. Once polished, porcelain can even reflect and transmit light through it precisely the way a tooth does! Prior to the surgical process Periodontists at Stoner Periodontics in Columbus will take an intraoral, digital scan of the mouth, and a CT scan of your jaws. This allows for absolute precision in planning the placement. All potential complications are handled in this step-on the computer simulated surgery-so they never occur during the actual surgery. This makes the surgical treatment as safe and minimally invasive as possible for the patient-resulting in little to no discomfort and incredibly fast healing. During the restoration process your dentist will take an impression (either by mold or digital) and send it to their dental lab for the abutment and restoration to be made precisely. This process is overseen by our office due to the precision required to have a long term prosthesis. The titanium is shaped by laser to precisely mimic the original and ideal shape and contour of the original tooth. Once the dental crown is in, the dentist will screw or cement that last missing piece to the abutment for the final look to come together. 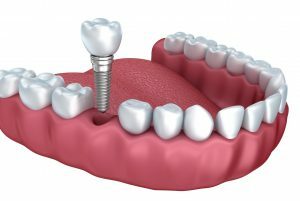 For many decades, there have been various procedures and treatments used to replace missing teeth patients of all ages have chosen dental implants to replace single or multiple teeth. This procedure has also been used as a foundation to support full or even partial dentures. In fact, there are many different kinds and designs of dental implants (temporary, mini, periosteal, zygomatic, transosteal, and, the most popular and successful implant design, endosseous). Which one is best for you? They all have their applications, and the Board-Certified Periodontists at Stoner Specialists are Columbus’ first choice to help you make your decision. The Board-Certified Columbus Periodontists at Stoner Periodontics have placed over 11,000 implants, so you know you will be getting the best in your care. Maybe you are debilitated from missing a front tooth and cannot smile, or need nutrition in order to battle diseases such as Crohn’s or diabetes, or you’re missing all of your teeth and hate the big, plastic “pucks” that float around in your mouth and aren’t secure. Whatever your challenge, we are here to change your quality of life now and forever. Call Stoner Perio and Dental Implant Specialists at (614) 392-7384.